The midst of Daikan, the coldness is at its peak though the temperature in Tokyo today is 14 degrees Centigrade (57 degrees Fahrenheit) which is those of March to April! It is interesting to see until now, the phrases to express the seasons have been wishful thinking. But this season faces the reality, the reality that you actually see in nature which is quite obvious that the season is nothing but we are right in the middle of the winter. The phrase today is about the water of the mountain stream. The first word, ‘Mizusawa’ means the water in/of the mountain stream. Knowing that the water around this season is the coldest, our ancestors have been taking advantage of it, used it and stored it for the future use. Still, we can easily imagine it was a bitter experience at that time when there was no modern heating installation to warm the frozen body after their hard work. The phrase continues with the adverb, ‘atsuku’ meaning thick relating to the ‘Mizusawa’, the water in/of the mountain stream. 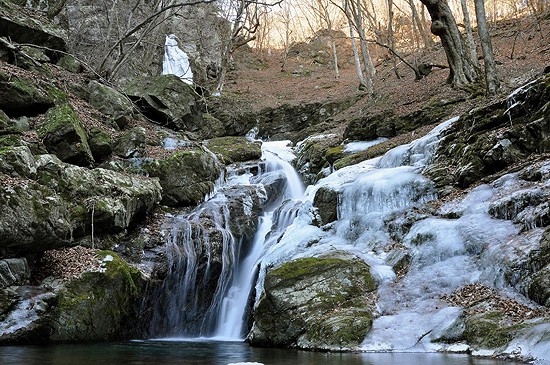 The last verb ‘katashi’ means to be hard or to be stiff which we now know that the water in the stream is frozen with its ice thick and stiff. Simply, a scene you may see outside in nature of Japan at this time of the year. But why did our ancestors who have been describing the season by searching traces of spring at this time of the year, felt like expressing the reality that they saw through their eyes for this hardest season? This is only our estimation but we think that the coldest season is indeed at its peak but is passing through, leaving us time for warmth of the spring increasing day by day, now we can bare, even if we face the reality. There are old proverbs in Japan, ‘Worry is often the cause of illness’ or ‘Clear your mind of all mundane thoughts, and you will find even fire cool’, similar to a proverb in English, ‘Care killed the cat’ which we feel has been a symbol idea of expressing the season hard to spend. 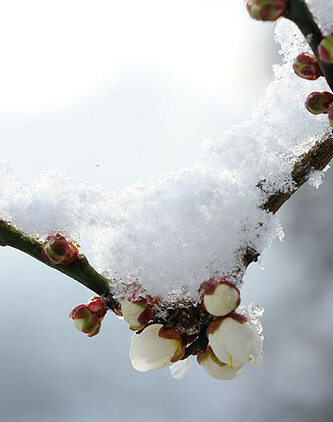 ‘Toji-bai’ buds about to bloom with snow. Photo from H’akushaku-sama no digital photo diray‘. There are some species of plum trees in Japan that bloom in this time of the year as ‘Touji-bai’ and ‘Kan-koubai’ which our ancestors have been giving heed to as they symbolized the arrival of early spring. The early plum blossoms in Japanese are called ‘Kanbai’, meaning ‘bai – plum’ of ‘kan (the coldest term in the year)’, identified with the plum blossoms that bloom later in the year. Plums are either thought to have its origin in Japan or have been brought in from China in the ancient times, leaving records of the plum-blossom viewing custom in the Imperial Court already in Nara periodW. It was the plum and not the cherry blossoms that attracted people to hold special events as blossom-viewing first until Heian periodW. You can find many poems concerning plum blossoms in the oldest Japanese poetry book of ManyoshuW, 118 poems in contrast with 42 poems on cherry blossoms. 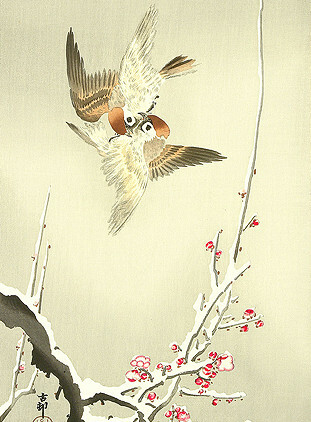 Beautiful artwork on this time of the year… By Koson Obara. Plums in Japan were set a high value to its blossoms first, then in Heian period, with the knowledge and technique brought in from China, became also ingredients of food and medicine. 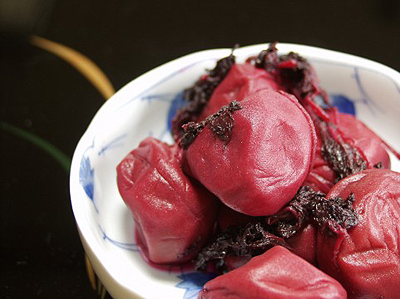 The most famous Japanese food made out of plum is UmeboshiW, salt plums or pickled plums, which is one of the popular content for typical Japanese packed lunch, OnigiriW. Sour-looking ‘Umeboshi’. Japanese would water inside their mouth for the sourness they have by just looking at them! Plum trees have been liked by the Japanese as a garden tree which you could find in many old and new gardens. They are also seen as motifs of family crests, arts, literature and songs in Japan which also shows that they have been one of the closest plant to the Japanese. 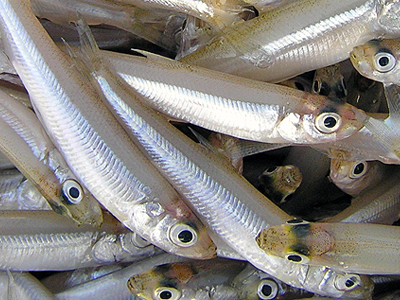 Wakasagi known as Japanese smelt or Hypomesus nipponensisW is a small long fish about 15cm that live in freshwater almost all over Japan and has been food fish for many years. Wakasagi is written as ‘official fish ‘ or ‘public fish’ in Kanji (Chinese charactersW) because the fish was used as annual tribute of Also Domain of Hitachi ProvinceW in the time of ShogunW, Tokugawa IenariW. Wakasagi was then the official purveyor goods, named as ‘official fish’ thereafter. Lively print of ‘Wakasagi’ by Ohno BakufuW, a master of Japanese fosh pictures. 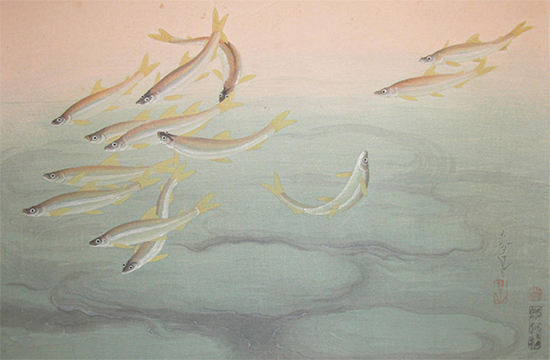 Wakasagi’s best season is thought to be from December to January when the fish carries enough fat (some female carrying eggs), juicy and rich in taste. The traditional Wakasagi fishing at this time of the year is ice fishing which is a way of fishing by drilling a hole on the ice of the water surface. This fishing is one of the fun things you could enjoy in cold districts but for those who cannot stand the cold weather but want to enjoy the Wakasagi fishing would go on the dome ship like fishing ship ‘Lake Flower’ of Fishing House Nagisa in Lake Yamanaka, Yamanashi prefecture. Wakasagi can be TenpuraW, deep fried and marinated as well as made to preserves with sugar, sakeW and soy sauce, into TsukudaniW. Like other seasonal words which we introduce in this column, Wakasagi too has been used as motifs and models of arts and literature. You can find several poems written by famous and anonymous poets on this tiny fish which is a key word to this season.